One of the oldest and the most renowned temple in Nizamabad is the Ramalayam in Dichpally. This 14th century temple dedicated to the Ram Avtaar of Lord Vishnu is also called the Indhoor Khajuraho and Khilla Ramalayam. Sitting on a hillock the Dichpally Ramalayam offers one, sweeping views of the quaint little town of Dichpally and is undoubtedly a worthy vantage point to enjoy the early morning breeze. 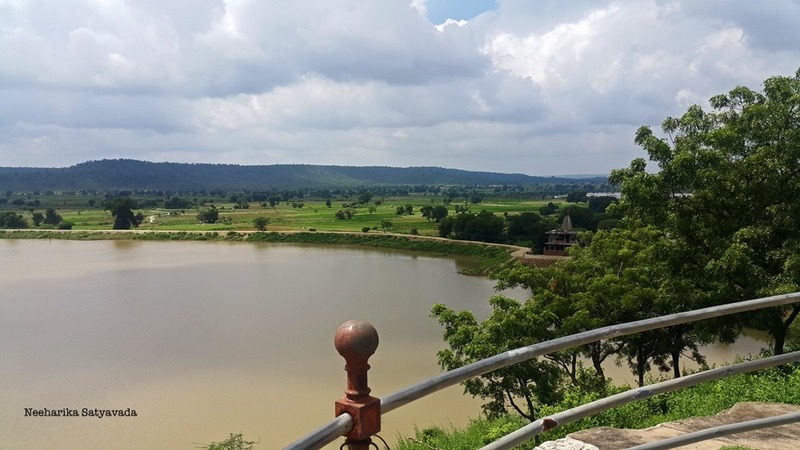 This also makes it a picturesque location for taking panoramic shots, with an almost submerged ancient mandapam just about visible in a clear lake on one side and little brick houses with red roofs lined along its bank on the other. While steps up the hillock lead you through an entrance typical of a fort complete with a fortification wall all around the temple grounds, which is probably why the locals now call this temple Khilla Ramalayam. Considered to be a fine example of the Kakatiya’s architectural splendour, this stone structure of black and white basalt has sculptures on its pillars that are reminiscent of the ones on the famous Khajuraho temples, bestowing on it the moniker of Indhoor Khajuraho, indicative of a time when Nizamabad was Indhoor, named so after a Rashtrakuta King. These carvings based on Vatsayana’s Kamasutra were so remarkable that even the name of this town traces its origins to it. These stone sculptures were called ‘Gicchu Bommalu’ by the villagers of that time, meaning pictures of Gicchu, the Sanskrit word for romance and beauty. Over time the village of gicchu, Gicchu Palle came to be Dichpally. In the 13th century when Ala Ud Din Khilji conquered Nizamabad, there began a trend where Hindu temples were not allowed to be built, so did the construction of this temple stop midway and it was only many years later that the idols of Ram, Sita and Hanuman were installed here. The temple as you see it today was only complete in 1949 when steps leading up the hillock and a subway connecting it to another popular temple in Nizamabad were built under the stewardship of Gajavada Chinnaya. Legend has it that in the Tretayuga, when right after meeting Hanuman for the first time, Lord Ram was on his way to wage war on Ravan, he stopped here on this hill and stayed a fortnight and it is to mark this that a Ramalayam was built here. Route: Take the NH44 from Hyderabad to Nizamabad. Around 15 kilometers before you reach the town of Nizamabad get off the NH7 to reach Dichpally. Getting There: The Ramalayam is the biggest and most popular place in town and the wider roads in town leading here are an evidence to that. Follow the sign posts and soon you will spot the ‘temple on the hillock’. Lovely pics…the houses are really nice….wd love to go into one of them! And the place is really clean & devoid of too many tourist & litter! !